Doña Lola Bus Stop on the A7 highway between Fuengirola and Marbella. The cars on the right are heading towards Marbella. To reach the Macdonalds Dona Lola resort by bus which bus stop do I need from your excellent list of bus stops between Marbella and Fuengirola? 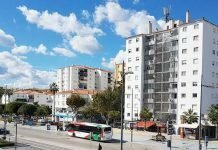 The bus stop you need is the Garu Calahonda bus stop. It’s the next one after the Riviera del Sol bus stop travelling from Fuengirola to Marbella. I took this photo from the footbridge over the A7 / CN340. You will see the Doña Lola sign on the sea side of the road. 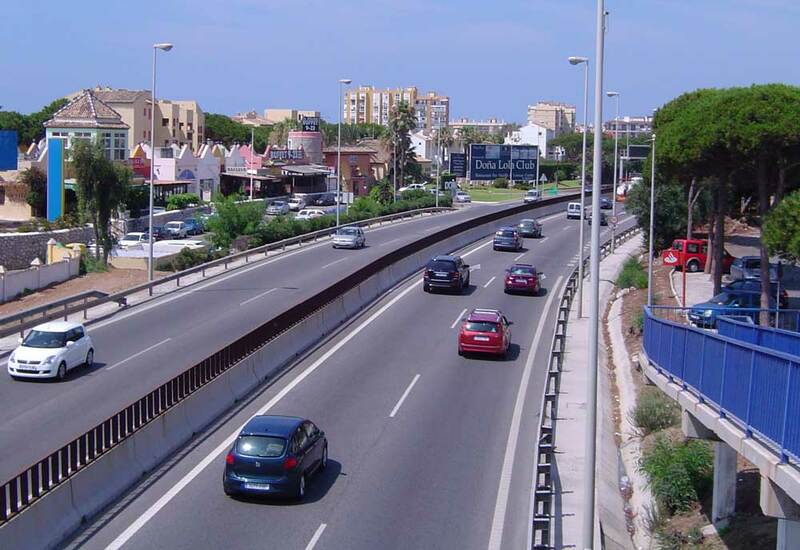 The Macdonalds Doña Lola resort is about 150 metres from the Garu Calahonda bus stop. 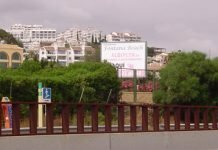 The traffic coming towards the bridge is travelling from Marbella to Fuengirola and the traffic travelling in the other direction is going to towards Marbella. There’s a great little bar called Al-Alcasur at the bottom of the footbridge on the sea side of the road. 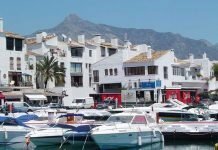 If you are pulling your suitcase, or coming back from shopping in Fuengirola from the Fuengirola bus station, just stop there, have a cold beer and a plate of fish, enjoy the pines, the noise, the smells and just relax a while. You’re in Spain, take it easy, that’s why you’re here. Have a great trip and use the pedestrian overpass bridges at all times! The traffic on the A7 is lethal. I hope you have a really good visit to Macdonalds Doña Lola. The weather is brilliant at the moment. P.S. The next stop is the Las Postas Calahonda main bus stop with a taxi rank right next to it. 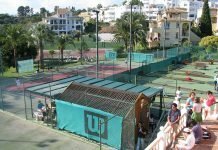 The train to Fuengirola followed by a second bus or taxi ride to Doña Lola and then using buses to explore up and down the coast is a very practical and stripped down option. If you are prepared to be patient at the airport and perhaps wait up to 30 minutes to collect your rental car and adventurous enough to brave the busy roads in July and August you will be completely independent! Travellers to the coast sometimes write to me because they have had their private coach or transfer service cancelled at the last moment and need other travel options. These services seem a little expensive to me but of course do allow you the luxury of being met at the airport and taken to the resort without further worries. If you explore the costs of the different services and measure your potential comfort and anxiety levels I am sure a choice will be become easier. One more option is to be met by a taxi for the same cost as the standard taxi fare. Having said that there are always taxis outside the airport. Please let me know if I can help further. If you could give me any more information to work off I can perhaps help you better. If I don't hear from you, I hope your visit goes well! Mike, taking similar trip and will stay at DL. Would you advise a rental car or private coach.